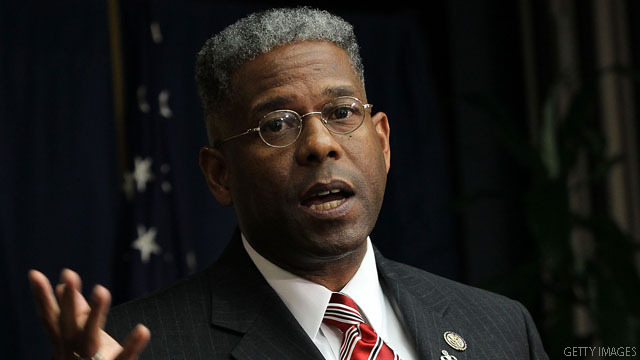 (CNN) – Florida Rep. Allen West's controversial comments have once again landed him in the headlines – this time with the sort of accusation not seen in Congress since the 1950s. At a town hall meeting with constituents in Jensen Beach, West was asked how many members of Congress are "card-carrying Marxists." According to CNN affiliate WPEC, West responded, "I believe there's about 78 to 81 members of the Democratic Party that are members of the Communist Party." West's campaign manager, Tim Edison, pointed reporters to West's next comments, when he says the members in question belong to the Congressional Progressive Caucus. "This group advocates for state control over industries, redistribution of wealth, reduced individual economic freedom and the destruction of free markets," Edison added in a statement. "These members of Congress advocate the type of policies that have put Europe on the brink of economic and fiscal collapse, and are driving the United States in the same direction. It is interesting that amid the swirl of feigned outrage and media misreporting of the Congressman’s remarks, all the attention is focused on the semantics, but no one is disputing the Progressive Caucus’s support for policies central to socialist and even Marxist systems." The Congressional Progressive Caucus responded to West's comments with a statement calling the comment and others like it "personal attacks." "Calling fellow Members of Congress 'communists' is reminiscent of the days when Joe McCarthy divided Americans with name-calling and modern-day witch hunts that don't advance policies to benefit people's lives," the statement, by caucus co chairs Reps. Raúl M. Grijalva and Keith Ellison, read. A spokesman for the Communist Party USA said Wednesday that the remarks are "not the epithet it once was." "We think it's ridiculous statement and totally untrue. It's clear he's trying to give the impression that there are people with a secret agenda in the Congress," party vice chair Libero Della Piana said. "We don't take offense at it. Really it wasn't a statement about us at all," he added, but rather a myth about Democrats. Last summer, West wrote an email to Florida Rep. Debbie Wasserman Schultz describing her as "the most vile, unprofessional and despicable member of the US House of Representatives." Last February, he described a fellow member of Congress who is Muslim as "someone that really does represent the antithesis of the principles upon which this country was established." West was suggested as a possible GOP vice presidential nominee last week by the party's most recent nominee, former Alaska Gov. Sarah Palin. The first term congressman said on CNN's "Newsroom" that he is open to the possibility. "(My family) has always stepped up to the plate to serve our country, and if it's the right thing, then I will do so. But I really doubt that would ever happen," he said. But, he has said, Romney has yet to call. The Democratic Party has been ambushed by Socialist Progressives and they even call themselves 'Progressive Democrats'. The socialist Democrats believe government is the answer and of course THEY are the government. Elitist arrogant people who KNOW what is best for you. They KNOW you aren't smart enough to regulate your life so, in THEIR opinion, for your own good, they will take care of you and TELL you what is good for you because they KNOW you aren't smart enough to even know what you need. They'll (Progressive Democrats) make the laws that YOU WILL obey and exempt themselves because these Progressive Democrats don't need no stinking laws, they ARE the laws. Yes there are communists in our government. (Barrack knew Anita Dunn's hero was Mao.) And whether you call them communists or progressives, they both want the central government to take control and of course THEY (Progressive Democrats) will be the central government. Limit terms of 8 yrs for congress and 6 yrs for President sounds better & better. Why does this even get any headlines? It's a provocative, fringe statement (I hope!). It's odd that the Democrats are trying to improve capitalism, to improve and help people follow the American Dream – life, liberty, and the pursuit of happiness – and it's getting twisted into some strange little sound byte to confuse voters and get them to vote against their pocketbook. Unfortunately, it's the less educated that will fall for these juicy mistruths. So no, Democrats are totally not Marxists and this feels like a ploy to avoid a conversation by demonizing the other. And he's a black man – he should know better than to make this type of comment that shuts down a conversation and just is an expression of ignorance and frustration at the economy, how difficult it is to live in a pluralistic society. This is America we can do better than this as a society. And the magic comes from the diversity of opinion talking it out and finding new ways of doing things. I am praying this type of comment doesn't get much credence. It's out there. Oh, the nostalgia of the GOP. Bringin' back oldies like Robber Barronism and McCarthyism. And the hit just keep on comin' but you still can't dance to it!! Where are the top-dog Republicans that are distancing themselves from this outrageous flashback to the early 50s? What I want to know is why isn't this story all over the news the way the true comments made by Rosen are? This guy is an idiot and a liar and this is almost swept under the rug. But the truth is being bashed?? What is this Never Never Land?